A Salish ork, selling potions, portents, potables, and reagents primarily at his stall in the Underground. 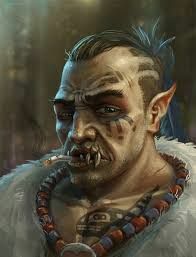 He was recently forced to move into the deeper tunnels due to the passage of Prop 23, as the Skraacha can’t turn quite as much of a blind eye these days. Good friend of Christopher Toff, they share a passion for ancient relics and legends thereof.